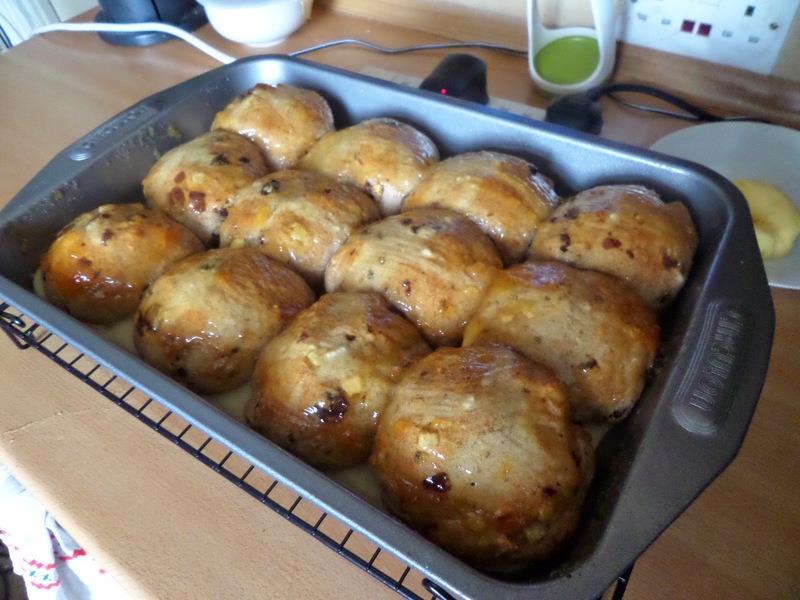 April’s Sourdough Surprises are going with the Easter theme, so it’s Hot Cross Buns! We love hot cross buns, so I’m going to do two batches: one using my rye starter, and one using my Sodo (wheat) starter. In the end I’m going to basically follow City Hippy Farm Girl‘s recipe, minus the brandy, as it’s a simple list already in metric. When it comes to fruit I don’t just want to use a random mix of dried fruit. I want my fruit dark, as I think that looks authentic. However I don’t think currants are right: they’re too small and tough for a nice soft bun. Sultanas would be too light in colour. So I’m going for dark raisins. Also I like the stickiness that candied peel gives to buns, so some of that will be going in too. For the spices I’m going to keep is simple and go with mixed spice and extra cinnamon. For the cross I’ll do a water, flour & sugar mix before baking. For the glaze I’m going to stick with a simple apricot jam glaze. Finally to get the nice pull-apart effects I’m going to bake in a tin. This all gets mixed together and kneaded in the mixer, before the usual hour raise, stretch & fold, hour raise, stretch and fold. Then it’s into 12 equal weight balls and into a tin to proof for two hours, which ended up being 3 hours due to a cold house. Then it’s into a max heated oven that goes down to 200C fan as soon as they’re in for 20 minutes, turning half way through. Once cooked they come out of the tin to cook on the rack, and while still warm get glazed with warmed apricot jam. I’m basically following the same recipe here, but adding extra rye flour to offset the 200% hydration of my rye starter, and of course adding more rye flavour, and adding chopped apple as Paul Hollywood suggests. Because the rye starter refreshes overnight, that batch went first. 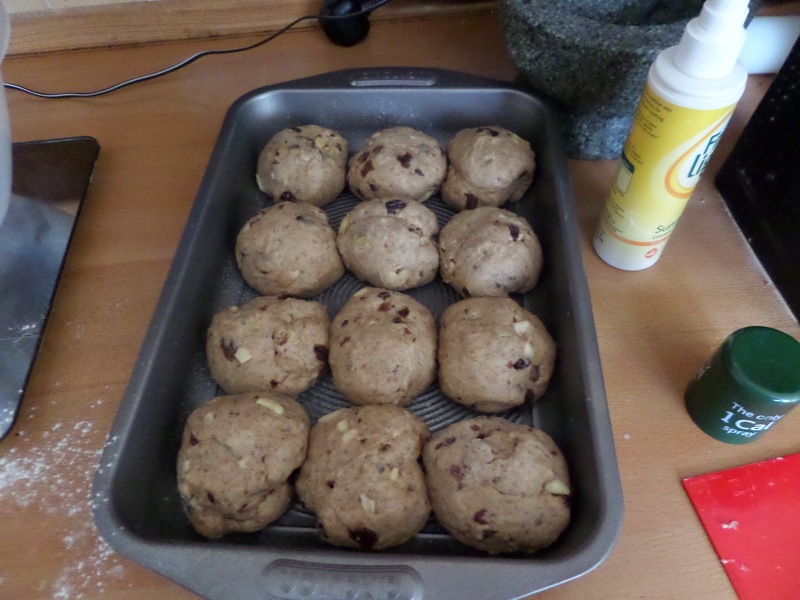 Things starter well with rises and folds and making into buns. The proofing, as noted above, was slow due to cold rooms… in fact they hardly expanded at all. But they got their crosses anyway, and went into the oven. The cross mixture was really runny and went everywhere, despite using a bottle to do it. 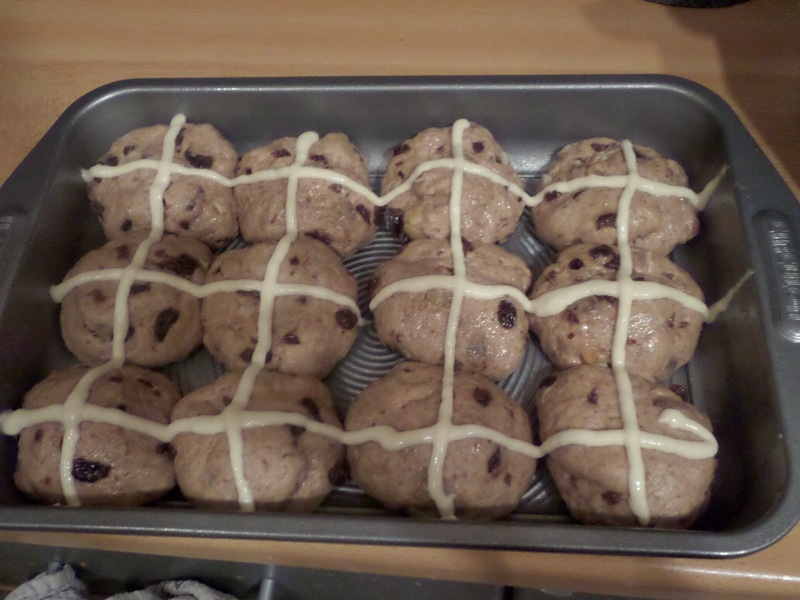 The crosses got worse during cooking… I’ll be using more flour for the Sodo batch! Also they took an extra 5 minutes than the 20 expected: typical rye! Cross or not… hot butter (hand-churned from Borough Market :) makes it delicious! So the Sodo ones got a much thicker cross. 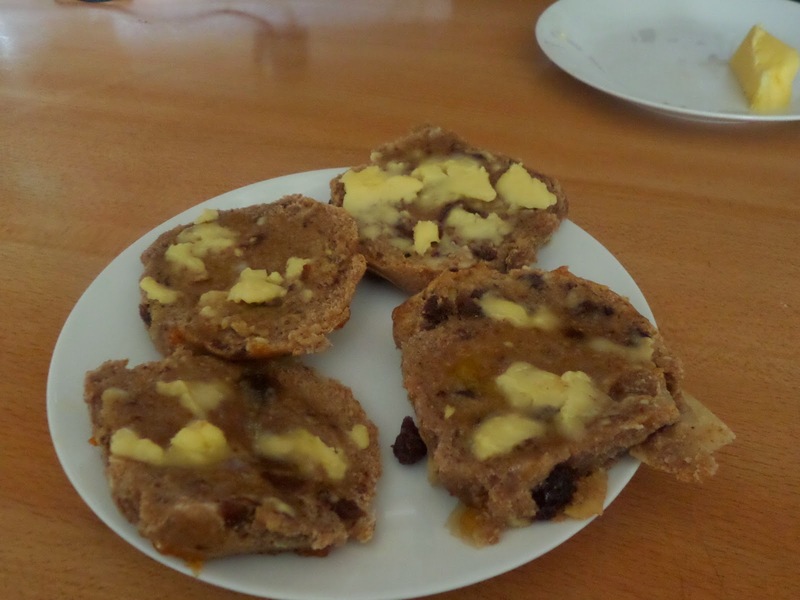 Once again we ate these with the posh butter. Both batches taste very similar, which is unsurprising as they’re basically the same recipe. If pushed I’d say the rye/apple ones are slightly nicer in flavour, but of course the Sodo ones have the better crosses! It is a trick getting all the elements to come together for these little buns! Love the idea of rye apple! You are making me want to convert my all-purpose white flour-fed starter to feed on healthier flours, as you do, with wheat and rye. Any tips for transition? My main advice would be to stick with mostly white bread flour. It doesn’t take much wholemeal to change the taste, and too much makes it hard to get a good gluten structure, plus the small amount rye actually helps the yeast develop (according to the Bread Matters book I’ve got). The apple-rye combo sounds great. Love reading all your recipe notes! It is lovely – I just wish I’d thought of using cider like you did! I agree that dark raisins produce better buns than currants. 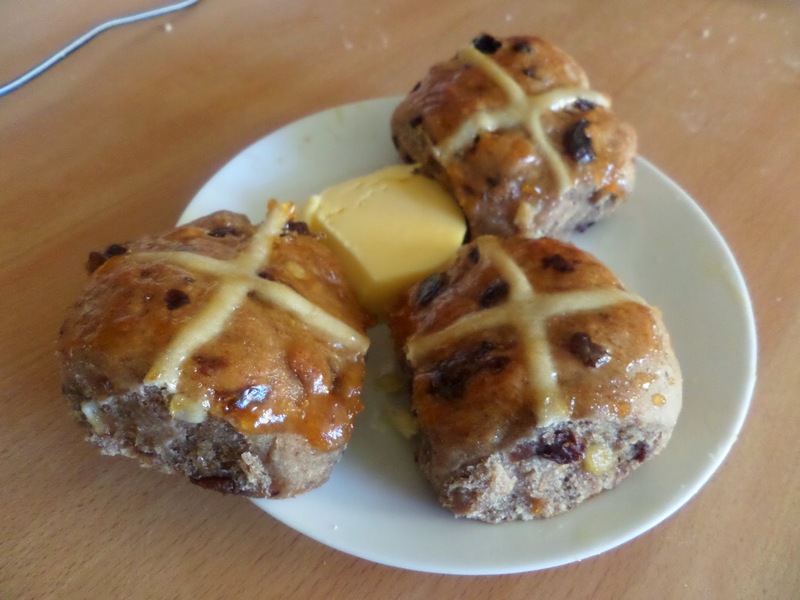 The crosses on your soda buns looked just right. Like the addition of apple to the rye. 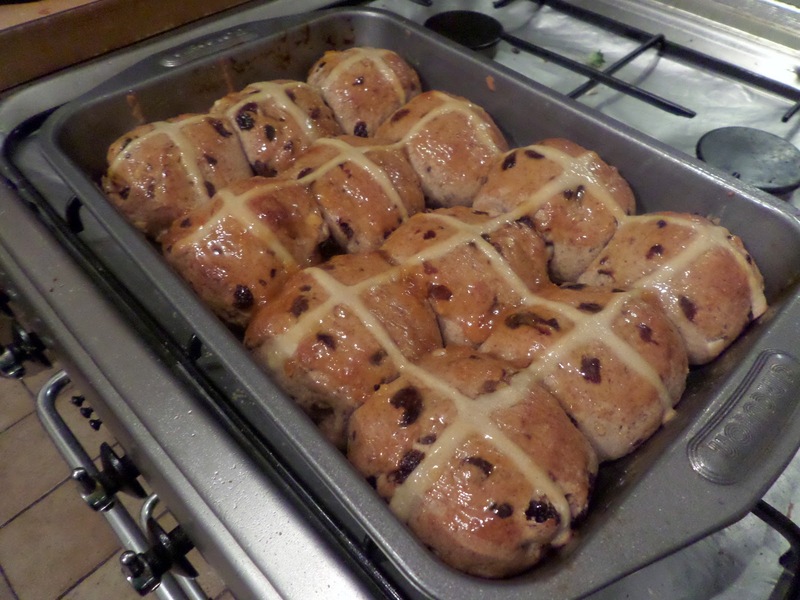 The hot cross buns look perfectly done. Rye apple buns are such a great idea. I’ll have to make those next time. These all look really wonderful. Awesome job! Love that you made two different versions – the rye/apple ones sound awesome! 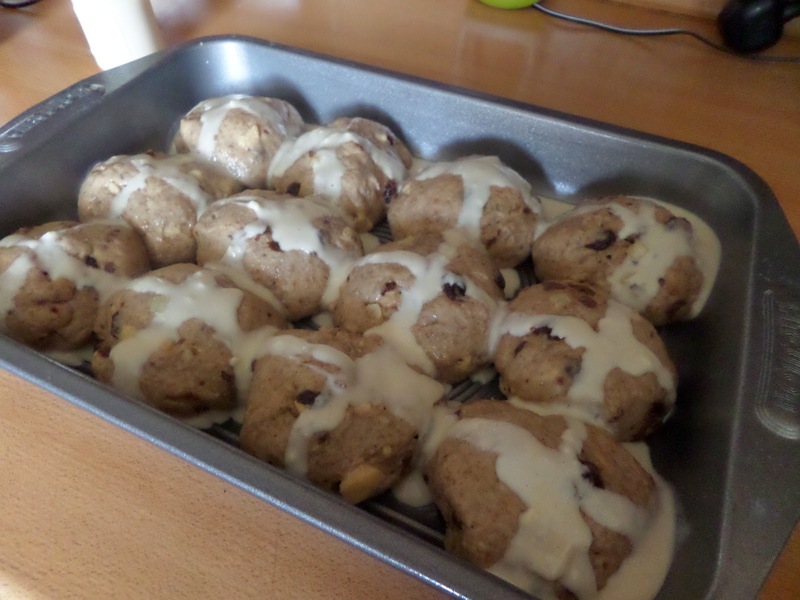 I love that you went all out with these, using all the different variations of starters you had :) I had never made hot cross buns before this, so it’s cool to see that you have previous experience – and preferences! Definitely want to try some of your experience/expertise next time I make these! I love how you break down your choices. Shortcrust pastry crosses? Seriously?? ?